Triumph stands as one of England’s most venerable marques. Triumph cars and motorcycles separated in 1936 but the brand has been producing motorcycles more or less continuously since 1902. Granted, there was that time period from 1983 to 1991 when not a whole lot happened aside from some bikes built under license by Les Harris. But technically, they’re the World’s oldest continually operating motorcycle manufacturer – a year older than Harley-Davidson. Today, the Hinckley-based Triumph produces a comprehensive range of motorcycles ranging from the Daytona 675 sport bike to the Trophy touring bike. Furthermore, the Bonneville, now in production in its current form since 2001, is the basis for all the models in the company’s line of classic bikes. Harris improved upon the old Bonneville a bit while they were being produced in the interim, but when Triumph reopened its doors in earnest in 1991, they fortunately had the foresight to see that things like electric starters, oil seals, and reliability were important. They came back to the market with a range of modern sport and touring bikes but in time it became apparent that there was still a great deal of nostalgia for the old designs. 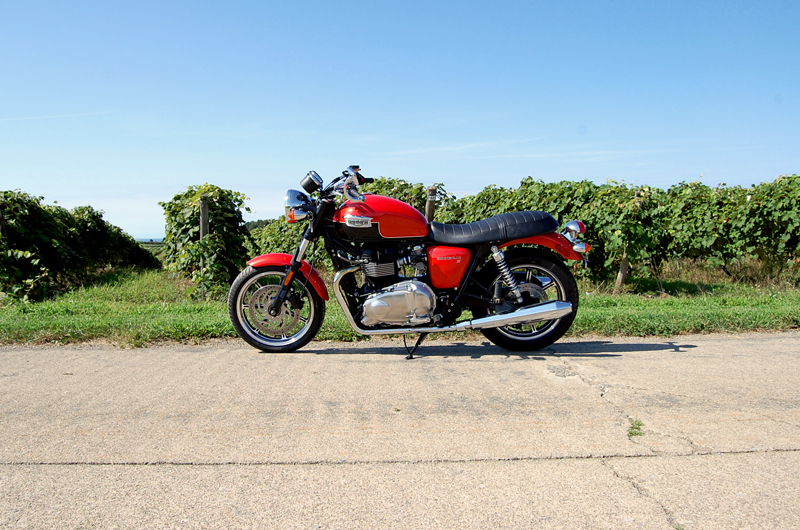 Work began on designing a new Bonneville in the late 1990s with styling to match Edward Turner’s original. The current Bonneville model has a great vintage look but is modern and has all the right stuff underneath – kind of like Christina Hendricks playing Joan on Mad Men. The parallel-twin engine configuration that powers the Bonneville is another ‘classic’ feature, though the current unit not only starts with a button, but also successfully retains its lubricants. The dual overhead cam 865cc engine is fuel injected and air and oil cooled. It produces 67 horsepower and 50 ft/lbs of torque to the rear wheel, driven by chain from the 5-speed transmission. Two counter-rotating balance shafts and a 360-degree firing order make this engine remarkably smooth. Vibration is negligible and only really noticeable at idle. Remarkable, particularly considering that the engine is structurally integral and solidly mounted to the frame. Acceleration can be quite brisk if desired and fifth gear comes quickly. Having a 6th gear would probably be a welcome feature, particularly on the highway. Around town or in thick traffic, the Bonneville works just as well as it does on country roads. While the engine produces most of its power fairly high up in the rev range, that is not to say that it’s all above 5000 rpm. Low end torque makes pulling away easier when maybe you’re not quite in the best gear for the situation. The handling is nimble and confidence inspiring. 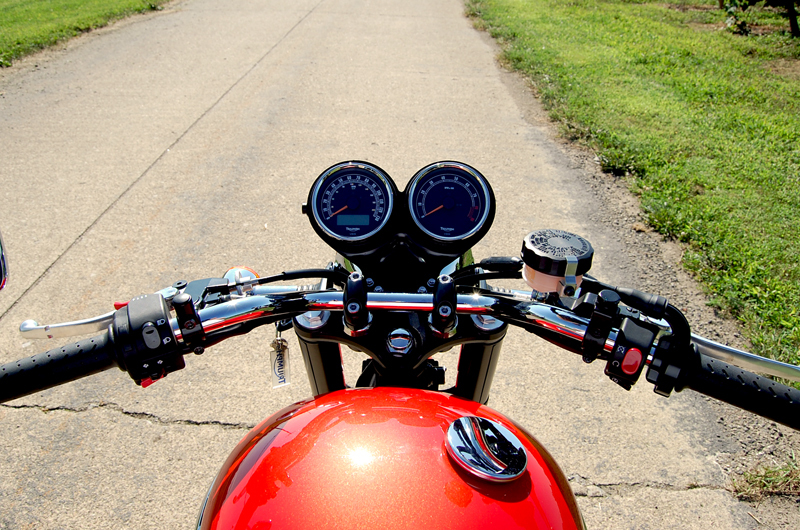 A fairly upright riding position makes day-to-day commuting comfortable unlike so many sport bikes. The handlebars on our test bike have been lowered about as close to the tank as they can go without hitting it. To my 5’10” frame, this feels a bit better than stock and adds a bit to the ‘low’ café-racer-ish look. The adjustable clutch and brake levers operate with a fairly light touch, which is refreshing if you’ve ever ridden some Harleys. Nissin calipers operating on discs front and rear achieve the braking and do quite a good job. While many bikes feature two discs on the front wheel, the Bonneville has a single, rather large rotor. Having just one caliper not only saves weight but also cost. 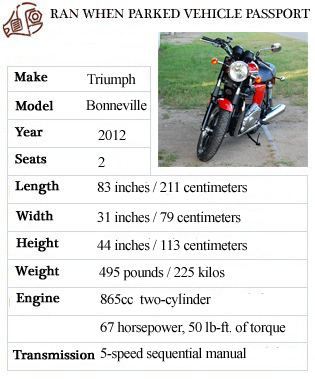 Ranging from about $7900 to $10,000 USD the Bonneville is a relatively inexpensive motorcycle. All models share the same running gear, while the SE model (which has been discontinued for 2013) tested here adds polished engine covers, a tachometer, and two-tone paint. The T-100 variant has wire wheels, different fenders and other detail differences that give it more of a 1960s look. Regardless of the trim level, the fit and finish of the Bonneville is excellent, particularly for the price. Nothing really looks or feels cheap. The controls have a quality feel to them and fall easily at your fingertips, though the switches look suspiciously like Kawasaki units. As a whole, the bike’s build has an almost Germanic feel. I must admit here, that I work for a Triumph dealership as a technician. Last month, our city held its annual three-day-long motorcycle rally. We were there representing the Triumph brand and I was given the use of this 2012 Bonneville SE for the weekend. When I rolled it out of the showroom, the odometer read 0.4 miles. By Sunday, it was up to nearly 200. I liked the Bonneville enough that by Tuesday, I bought it. At the time of writing, I’ve put over 800 miles on the bike (my BMW and Saab are getting some time off), and it still continues to impress me. 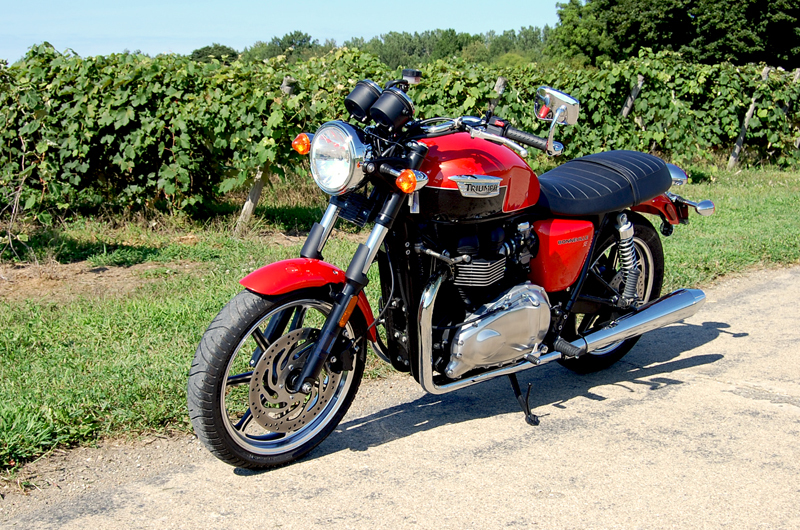 The new generation Bonneville is certainly a “triumph” indeed. Previous post ← Is the Datsun 510 Hatchback a future classic? one of the bikes that is still on my “to buy” list. great write up. I’m glad to see the Triumph mark still around. Back in the 60s you used to see a lot of them but they kind of faded away due to lack of new designs. I keep thinking back to Burt Hopwood’s book, ‘What Happened to the British Motorcycle Industry?’ where he said that good designers should keep designing and not get promoted to management. It seems that the man who designed the revolutionary Speed Twin just couldn’t see anything better and insisted on building variations of the same well into the 70s. This bike is truly a breath of fresh air, with some tradition still around.